Las Vegas has an amazing number of marriages every year. In 2005, 122,259 marriage licenses were issued in Clark County, Nevada. One of the most popular days of the year, Valentine’s Day, is for weddings in Las Vegas. Las Vegas is a popular site for weddings partly because the only requirement is a license. Nevada Marriage license cost $55, payable in cash, and can be obtained at the Clark County Marriage Bureau, 201 Clark Ave., Monday - Thursday, 8 am-midnight and 64 hours straights, from 8 am Friday until midnight Sunday. The office is open 24 hours during all holidays. No blood tests are needed and there is no waiting period. Couples can purchase a license and say their vows at the Office of Civil Marriages or buy a license and get married elsewhere. 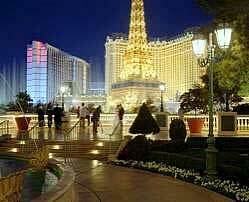 Once a Las Vegas weddings license is obtained, it can be used for up to one year. Call 702-671-0600.